Welcome to the third edition of the Gemma Rose Project Rescue Spotlight! We’ve been busy here at GRP and are excited to introduce you to Charlotte from Texas! Meet Charlotte from Texas! Charlotte has dedicated her life to making sure so many wonderful animals have a loving home. What is the ‘rescue spotlight’? The rescue spotlight is a core component in the Gemma Rose Project’s mission. It’s purpose is purely to raise awareness of animal rescue, the people involved, while giving a genuine insight into what happens behind the scene. We want to make the general public aware of the good, the bad and the ugly truths about what goes on. The rescue spotlight also gives us an opportunity to award those who are dedicating their lives and giving up their valuable resources to help animals in need. Our third edition and April 2017 rescue spotlight award goes to Charlotte from Tyler, Texas. Charlotte is affiliated with a rescue we work closely with, Eleventh Hour Rescue. She’s rescued and impacted the lives of so many dogs that she’s lost count over the years. Charlotte is such a kind human and we can’t thank her enough for what she’s done in the animal rescue community. Take a read below at her experience in animal rescue and some of the stories she has to share. Thank you Charlotte, we tip our caps to you and thank you for your service to the beautiful animals of this world. Gemma Rose Project: Tell us a little about yourself and how/when you got into animal rescue? My name is Charlotte and I have been in rescue and fostering for about 15 years continuously. There are over hundreds of dogs that have come through here, also some cats! I’m a 63 year old widow and these dogs have become my life- not such a bad thing most day’s haha. I’ve always been one to rescue a stray dog or a dog that just showed up, and try to find them a home. 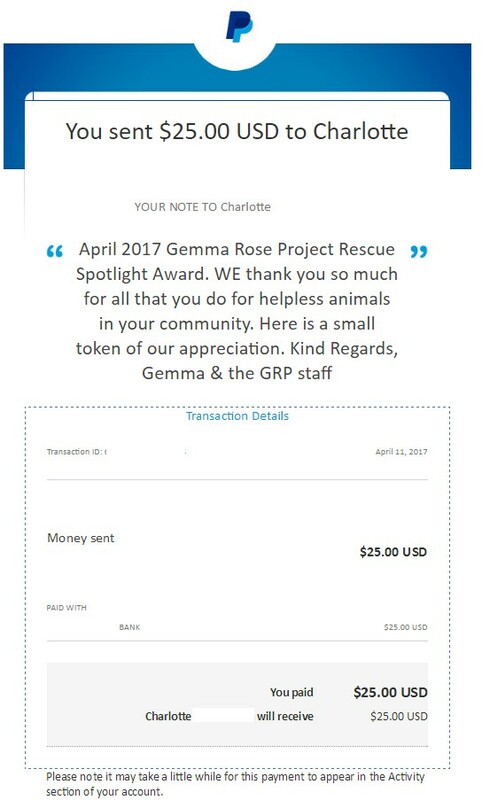 Gemma Rose Project: What is your most memorable moment in animal rescue? ; is there one that stands out the most? Charlotte: My most memorable moment, which also happens to be what really got me into rescue officially, was coming home from work one night and seeing a bunch of eyes in the middle of the road; way out in the boonies as you might call it. I thought it must be a bunch of baby possums or raccoons because it looked like a hundred eyes. But when I stopped I saw it was nine puppies somebody had just left in the middle of the road. I guess I scared them when I got out of the car because they all scattered. I get out of my car and I’m running around in the pitch black trying to catch puppies because I knew that a coyote or another predator would get them. I was only able to catch five of them in that moment, so I went home and got a flashlight and some help and came right back. Yes, we did get all of them except for one, but we got him the next morning. We found him hiding in a man’s barn under a tractor! I guess that would have to be one of my most very memorable moments, as it was one of the first rescues of many and what got me started on this long road. Gemma Rose Project: How many dogs have passed through your foster-care in those years? And how many times have you ‘foster failed’? Charlotte: To tell you the truth, I don’t know if I could count the dogs that I have fostered over the years. I have Foster failed a few, but most of those had medical issues or were senior dogs. I have a very soft spot for the seniors and have quite a few with me here. I also have two that were puppies when they came to me and they are still with me- they are about 13 years old now. They are definitely my dogs. I don’t look at a foster fail as a failure per say, but as it was meant to be. Gemma Rose Project: How do you handle bringing in animals that don’t get along with each other? Have you ever come across such a scenario? Charlotte: I do have dogs that do not get along with some of the dogs here, whether it is just a certain dog they don’t like or all of the dogs. I usually deal with those issues by crating and rotating. It certainly is not always easy and I try to find a better place for them if I can, but not always easy to do. Gemma Rose Project: How has fostering and being involved in animal rescue impacted you financially? Charlotte: As far as financially, it has impacted me quite a bit because I am on a lower income bracket now and I cannot work as much as I used to. Funding is very essential in any type of rescue, especially with the numbers that I normally keep here. Many of the dogs are on medications and have repeated testing done as seniors; plus new dogs coming in need special foods, medicines, vetting, and treatment. I truly am at a point where I have to cut down on the amount of dogs I can help. Gemma Rose Project: What is a something about animal rescue that you would want the general public to be aware of? Charlotte: I think what I’d most want people to know about rescue and to be aware of is how much they can help. Even if you can’t bring a dog into your home or more dogs into your home if you already have any, you can support rescues and foster homes. Also, I would encourage people to help educate others, to reach out and help even if it’s just a little bit. If you want to foster and can take a dog into your home, start by taking them one at a time, it is not as hard as it seems. Gemma Rose Project: What has been the most rewarding about your experiences rescuing animals? Charlotte: The reward that you get when you see the dog you were fostering getting placed into a home that is going to love them and care for them, is just beyond measure. When I send these poor neglected and abused pups that came here from Texas, who were about to be killed for space or time, or starving on the streets, to an awesome rescue group such as 11th Hour in NJ, and see them in their homes- it is just a great reward! We at Gemma Rose Project, again want to thank Charlotte so much for taking the time to share her story with us. Charlotte has dedicated her entire life, her financial resources, her time, to saving hundreds of animals through her lifetime. If there was a hall-of-fame for animal rescue, she would be in it. Thank you for taking the time to read Charlotte’s story. Thank you again for reading and supporting our mission! Happy Spring!